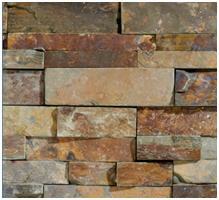 Slate ledge stone in Denver is usually applied indoors, as accent walls, fireplace surrounds, and elsewhere. While slate ledge stone is a fantastic choice in such installations, indoor use does not take full advantage of slate’s best feature—its durability in harsh weather. Slate is called the “sheltering stone” because of its historic use as a roofing material. In that role, some individual slate shingles in Europe have been in place, performing as when new, for centuries. At PetraSlate, our slate-based products, including the ledge stone we offer, is sourced from quarries all over the world. This is important because not all slate that is quarried is of equal value. Unlike a big box retailer, we aren’t interested in just any building material that can legally be called slate. Due to the circumstances of its formation, only deep veins of slate have witnessed the time and pressures needed to compress it into the density and surface hardness that we seek. We travel the world to work with established operations that are busy quarrying out the quality of slate that we seek. We are also constantly looking for slate products, like the ledge stone we carry that feature that same level of material quality built into them. PetraSlate has, like our discerning clientele, chosen to go with properly selected slate products rather than ones manufactured from early cuts of near surface slate that weren’t as geologically compressed as we demand, you can buy with confidence that ours will stand the test of time in any application. Properly installed and sealed against backside water infiltration, the slate ledge stone we carry for the Denver market will provide decades of service when used to face dramatic outdoor fireplaces, cooking stations, bars, or bench seating. Protect the joints and seams with adequate waterproofing against our freeze/thaw cycle and the slate itself will do the rest of the job of weathering well. You will be continually impressed by the wisdom of your choice during season after season of outdoor entertaining. The second best feature of slate, after its endurance, is its color spectrum and variegation. From off white, to buff colors—those tan, yellow, and brown hues—through green, and approaching black, there is a color of slate ledge stone to suit the tastes of anyone. For samples or more information, don’t hesitate to contact us at PetraSlate today.